Mahindra Two Wheelers Limited (MTWL) was established in 2008 after the parent company Mahindra & Mahindra Limited acquired select assets of Kinetic Engineering. Headquartered in Pune, Maharashtra, it is a group venture owned by M&M and is known for manufacturing scooters and motorcycles. For the development of its scooter line-up, MTWL partnered with Taiwan based Sanyang Industry Company (SYM) and Italy-based ‘Engines Engineering’ which provides research and product design based support. The company has a production unit at Pithampur, Madhya Pradesh and a research & development center at Chinchwad, in Pune. n 2011, MTWL became the first Indian company to participate in FIM Moto3, Motorcycle Racing Championship. Mahindra Two Wheelers launched one of its crucial models in the 110cc bike segment, Centuro in July 2013 followed by its game-changing model, Mojo in 2015. Mahindra Gusto is a decent design bike. This Bike is preferred by the customers looking for a daily commuter yielding healthy economy to save on their monthly expenditure on fuel. With all these things in mind and of course considering that pricing could not go beyond the affordable limit. Mahindra Gusto new part comes mostly to the front part of the scooter as it uses a different pattern of false air intakes than the older model. Gusto has six intakes and chrome stripe on the side panels clearly differentiates the newcomer. 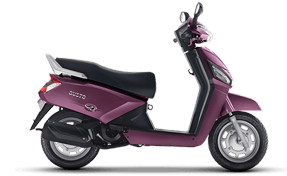 The Gusto comes with a conservative body style and uses matching color inserts on the new dual-tone shades on the 125 cc variant. Gusto 125 uses the same 130 mm drum brakes for the front as well as the rear wheel. Mahindra Gusto 125 provides tubeless tires measuring 12 inch which looks very glitzy. The Gusto 125 has curves and edges on the front which makes this ride sporty. Mahindra Gusto 125 uses telescopic suspension at the front and hydraulic coil type at the rear as well. The new front apron which has been redesigned and we must say it does look better than the standard scooter. The analog instrument cluster has been carried forward which houses a speedometer, odometer, fuel gauge and various telltale lights. The cluster is easy to read on the go but we would have liked to see a digital console though. Mahindra Gusto includes height adjustable seat, remote flip key and LED pilot lamps. Mahindra Gusto has 125 cc engine on the new Gusto is much more refined than the older engine even after using the same air-cooled and carburetor fed fuel system. The motor is good for 8.5 BHP @ 7,000 rpm and 10 NM @ 5,500 rpm. Gusto is a great option for everyday riding and comes with CVT for more relaxed automatic gearshifts. Mahindra offers a lot of features which are exclusive to the Gusto only. gusto comes with a height adjustable seat, making it easy for the rider to adjust the seat height between 735-770 mm. It comes with a car like a flip key and finds me lamps for finding Gusto easily in large parking lots. It has quick storage under the instrument console. Gusto’s console is simply beautiful, displaying every little bit of the required values through its analog speedometer and odometer. The fuel gauge is again analog, with the whole of the console enclosed in a silver casing, dividing it into 3 different sections. The third section houses the LED indications for turn indicator and others. Mahindra Gusto is the scooter that far surpasses all others, this is because of its tough performance, great mileage, and its numerous, innovative car-like features. This is preferred by customers looking for a daily commuter yielding healthy economy to save on their monthly expenditure on fuel. Mahindra Gusto offers high-performance MTEC engine. It has telescopic suspension with air springs. Gusto has quick storage and spacious under seat storage too. It has bright Halogen headlamps with are helpful in nights.